See-Dub: Vacation 2010: DC - Holocaust Museum. How can we describe this place? From the very beginning, we could FEEL the difference as we entered. For one, each of us received a booklet describing one Holocaust victim. Taking this wide-reaching event and putting it in terms of one human life helped us relate in a tiny way. Then we took an elevator to the fourth floor where the exhibition begins. We saw images to represent what Allied forces found when they discovered the concentration camps. Then we went back to pre-Nazi Germany so we could see the events that led up to Hitler's reign. Along with posters, letters, pictures and other artifacts, small theaters are scattered throughout, each showing a different film, such as The Nazi Rise to Power. It was startling to see what we'd read about it history books, to realize how quickly Hitler was able to effect change once he became Chancellor of Germany. Being there made it easy to imagine what it was like for Jewish families who desperately needed refuge, and it wasn't hard to see why so many thought their best bet was to go along with the new regulations. Of course, it's all so horrific, but it's startling to see that kind of hatred in action—and to see images of the ones affected. It was also eye-opening to learn about the state-sponsored euthanasia program, through which 70,000 disabled Germans were killed because they were considered "life unworthy of life." These atrocities were deemed necessary because Germany was at war. As we walked through the exhibit, we moved from the "Nazi Assault - 1931-1939" section to the "Final Solution - 1940-1945" part. There we walked through a boxcar that was used to transport Jews to a concentration camp, and we saw bunks from Auschwitz. (I immediately thought of the picture of Elie Wiesel, crammed into a bunk in Buchenwald.) We saw a haunting model of the gas chamber that showed all the people walking into the chamber but never coming out. This is one part that has remained with Katie. She said she thinks about the pregnant women and children who were taken to the gas chambers immediately after arriving. They went willingly because they were told they'd be allowed to take showers there. And then there were the video monitors that were obscured by chest-high barricades (to keep young children from seeing those videos). Horrific doesn't come close to describing the medical experiments and other atrocities these people faced. By the time we made it to the final section, "Last Chapter," we were overwhelmed. There we heard testimonies from survivors. Hearing their voices really personalized each story. We also saw a wall that listed a bunch of names, heroes who had risked their lives to protect Jews and others in danger during that time. This section also helped me realize that liberation did not mean all was well for survivors. Most had no home or business to return to, and they had no idea where family members were—or if they even survived. For some reason, I'd allowed myself to think that survivors were awash in relief once Allied forces opened those camp gates. But isn't that what we do? We hear about terrible things, and our brains try to soften the horror, lessen the awfulness. But the Holocaust is horrific to the point that seeing this evidence, hearing these stories, learning the chronology make it utterly incomprehensible. And it's frightening to know that humans are capable of such hate. There are so many lessons to be learned from those terrible years, and this is one of them. Injustice is an affront to all humanity, not just those affected. If all we do is protect the rights of the majority, we're missing our calling. Especially as Americans, we must defend the right of individuals to life, liberty and the pursuit of happiness. That includes those civil liberties protected by the Bill of Rights. Even when we don't agree with the minority? ESPECIALLY when we don't agree with them! If we wait until we're losing our own freedoms, it's too late. I strongly recommend a visit to this museum, but it takes a little planning. From March to August, you must have entry passes to see the permanent exhibition. To avoid lines and uncertain entry times, you may buy tickets online through the museum's website. Admission is free, but online passes are $1 each. It took us about 3 1/2 hours to see the museum, and after our visit, we were in no mood to take in other DC sights. Instead, we took a lunch break to decompress and process all we had seen. 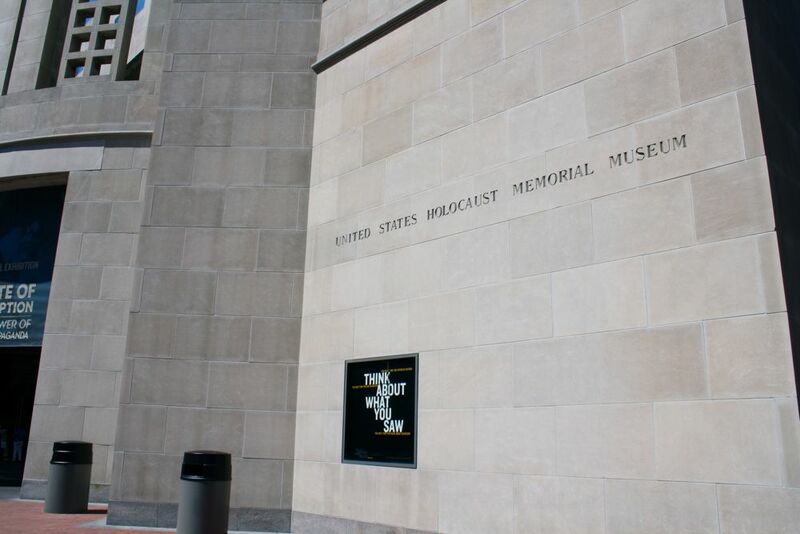 I'd strongly recommend tourists build in some "down time" after seeing the Holocaust Museum. I have been there a couple of times - so heartbreaking. I think everyone should go and see and remember, always remember.